How to calculate the median. 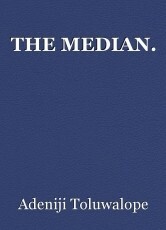 The median is defined as an average,which is the middle value when figures are arranged in order of magnitude.In an even distribution,the median is the average of two middle Number.In other words,the median of a distribution is the middle value when the observation are arranged in order of magnitude starting with either the smallest or the largest number.The median is therefore the value of the middle item. A.when the numbers involved are odd numbers,the median will be the middle number. © Copyright 2019 Adeniji Toluwalope. All rights reserved. This page was created in 0.4883 seconds.